Bouncing onto the C64 comes an unlikely new hero - Barnsley Badger! From the team that brought you hit C64 releases like Soulless and Guns 'n' Ghosts. Take control of a down-on-his-luck Badger on a quest for the fabled treasure of Tutanbodger. Will it solve all his money problems, or will he fall asleep on the way? C64 tape - presented in a clear cassette case with full-colour glossy inlay. Budget C64 disk - presented in a glossy disk sleeve with full colour label. Premium+ C64 disk - presented in a clear case with full-colour double-sided inlay. Meet Barnsley, a lazy, good for nothing badger whose addiction to gambling has got him into all sorts of trouble. One night in his local boozer he overhears a conversation. A gold coin was discovered in the nearby graveyard, a coin carved with the head of the fabled ruler Tutanbodger on one side. If Barnsley can find the lost treasure of Tutanbodger it would solve all his money problems. A great journey awaits - as long as he doesn't fall asleep on the way! • Huge 120 screen map to explore! • Various weird and wonderful meanies to avoid! 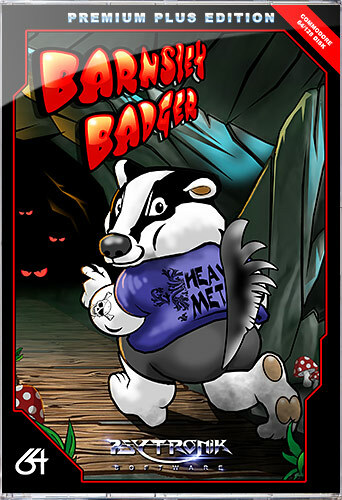 • Collectible items to power-up your badger! • Gorgeous retro-style hi-res graphics!